Savane Pants. 68% polyester, 32% rayon, machine wash. Fabric is navy blue. Rise: 14.5 in/36.83 cm. Flat front. Really Nice, Well Made Pants. Color says "Taupe" - is a pretty shade of brown. New with no issues or odors. Across Waist (aligned) - 17 (34). SAVANE TAUPE FLAT FRONT STRAIGHT FIT TAILORED CLASSIC PANTS 34/34 NWT. THE PANTS ARE TAPERED AND REFINED NO BAGGY. COLOR/S: TAUPE. Savane dress pant. lovely condition. 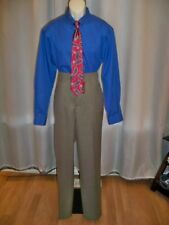 Savane Mens Dress Pants Size 34 x 26.5 Pleated Polyester Sharp! Pants were altered from 29" inseam to 26.5". Very sharp! Rise: 12", 31 cm. SAVANE PANTS. PLEATS FRONT. WAIST: 17", INSEAM: 29", LENGTH: 40". COLOR: BLACK. SIZE: 34/29. You are buying one pair of pants by savane 34 x 29 pleated & cuffed 50% polyester 50% rayon. you are buying one pair of alan flusser 42 x 30 pleated & cuffed 75% polyester 21% viscose 4% wool. You are buying one pair of pants savane 34 x 30 80 % polyester 20% rayon pleated & cuffed. We buy only lightly used good quality pre owned pants for resale. You are buying one pair of pants savane 36 x 34 pleated & cuffed 50% polyester 50% rayon stain / fabric protection. We buy only lightly used good quality pre owned pants for resale. You are buying one pair of pants by savane 36 x 34 pleated no cuffs 50% polyester 35% rayon 15% linen. You are buying one pair of pants savane select edition 34 x 32 pleated & cuffed 64 % polyester 34 % rayon 2% spandex. You are buying one pair of pants savane 34 x 30 pleated & cuffed 65% polyester 35% rayon. We buy only lightly used good quality pre owned pants for re - sale. We buy only lightly used good quality pre owned pants for resale. You are buying one pair of pants by savane 34 x 32 pleated & cuffs 100% polyester with waist extensions. you are buying one pair of alan flusser 42 x 30 pleated & cuffed 75% polyester 21% viscose 4% wool. You are buying one pair of pants savane 36 x 34 pleated and cuffed 70% polyester 30% rayon. we buy only lightly used good quality pre -owned pants for resale. You are buying one pair of savane deep dye 34 x 31 pleated & cuffed 63% polyester 37% rayon. We buy only lightly used good quality pre owned pants for resale. You are buying one pair of savane 34 x 31 pleated & cuffed 80% polyester 20% rayon. We buy only lightly used good quality pre owned pants for resale. You are buying one pair of pants savane deep dye 34 x 32 65 % polyester 35 % rayon pleated & cuffed. you are buying one pair of alan flusser 42 x 30 pleated & cuffed 75% polyester 21% viscose 4% wool. You are buying one pair of pants by savane 34 x 26 pleated no cuffs 50% polyester 50% rayon. We buy only lightly used good quality pre-owned pants for resale. You are buying one pair of pants which are savane techworks 34 x 32 pleated & cuffed 75% polyester 25% rayon. We buy only lightly used good quality pre owned pants for resale. We buy only lightly used good quality pre owned pants for resale. You are buying one pair of pants by savane 34 x 32 no cuffs 88% polyester 10% rayon 2% spandex. We buy only lightly used good quality pre-owned pants for resale. You are buying one pair of pants savane 34 x 30 pleated & cuffed 50% polyester 50% rayon. you are buying one pair of alan flusser 42 x 30 pleated & cuffed 75% polyester 21% viscose 4% wool. You are buying one pair of pants by savane 34 x 31 pleated & cuffed 63% polyester 37% rayon. we buy only lightly used good quality pre -owned pants for resale. 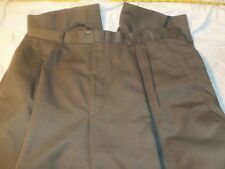 You are buying one pair of pants by savane 34 x 29 pleated & cuffed 81% polyester 19% rayon. You are buying one pair of pants savane 36 x 34 pleated & cuffed 63% polyester 37% rayon. we buy only lightly used good quality pre -owned pants for resale. You are buying one pair of pants by savane 34 x 31 pleated & cuffed 80% polyester 20% rayon. we buy only lightly used good quality pre -owned pants for resale. You are buying one pair of pants by savane 34 x 26 tailored 2u no cuffs 88% polyester 12% rayon. We buy only lightly used good quality pre-owned pants for resale. You are buying one pair of pants by savane deep dye 34 x 32 pleated & cuffed 63% polyester 37% rayon. we buy only lightly used good quality pre -owned pants for resale. We buy only lightly used good quality pre owned pants for resale. You are buying one pair of savane 34 x 31 pleated & cuffed 63% polyester 37% rayon. We buy only lightly used good quality pre owned pants for resale. You are buying one pair of pants by savane deep dye 34 x 32 pleated & cuffed 65% polyester 35% rayon. we buy only lightly used good quality pre -owned pants for resale. We buy only lightly used good quality pre owned pants for resale. You are buying one pair of pants savane deep dye 34 x 32 no wrinkles no stains 63% polyester 37% rayon pleated & cuffed. you are buying one pair of alan flusser 42 x 30 pleated & cuffed 75% polyester 21% viscose 4% wool. You are buying one pair of pants savane 34 x 34 pleated and cuffed 72% polyester 28% rayon with waist extensions. We buy only lightly used good quality pre owned pants for resale. You are buying one pair of pants by savane 34 x 30 pleated & cuffed 50% polyester 50% rayon. you are buying one pair of alan flusser 42 x 30 pleated & cuffed 75% polyester 21% viscose 4% wool. You are buying one pair of pants savane 42 x 30 no cuffs 64% polyester 34% rayon 2% spandex. 73% Polyester. 25% Rayon. 2% Spandex.NWT. Savane Navy Blue Select Edition Men’s Size 36x34 Dress Or Casual Pants RN #37763 Very Good Used Condition! ******PLEASE NOTE Loose button at inner Waistband********** Waist 36 Inches Inseam 34 Inches Please return if you are not 100% satisfied and as always - EXPECT FAST DELIVERY! TYVM! PANTS ARE IN EXCELLENT USED CONDITION. PANTS DO NOT HAVE CUFFS. COMFORTABLE WAIST - EXPANDABLE (SEE PICTURE). You are buying one pair of pants by Cellini linea uomo 32 x 34 pleated no cuffs 80% polyester 20% rayon. We buy only lightly used good quality pre-owned pants for resale.